In the winter of 1973, ABC premiered a series of animated shorts that would change the lives of kids forever. 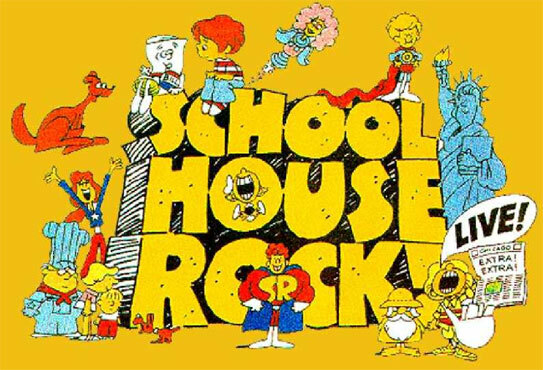 Thanks to commercial advertising exec David McCall’s Schoolhouse Rock, we learned so many things that we just didn’t feel like paying much attention to before. We suddenly were able to memorize the Preamble to the Constitution. Even though we weren’t good with numbers or blades, we learned to skate a figure eight. We got scientifically groovy with Interplanet Janet. And we were reminded that a noun is a person, place or thing. And we discovered it all in the safety of our homes, in the comfort of our feety pajamas, on a Saturday morning as we ate our Cocoa Cripsies. In honor of the 40th Anniversary of Schoolhouse Rock, we present some of our all time favorites. Which ones did you like best?